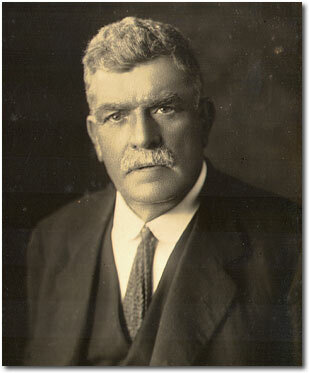 Charles Henry Hoskins was born on 26th March 1851 in London and came to Australia aged two with his parents. He started work as a mail boy at Ballarat, then tried the diggings, without success. At the age of 25 he went to Sydney to join his brother in a small engineering enterprise. The firm G & C Hoskins began by doing general engineering work in 1874 and grew to become one of the largest suppliers of pipes in Australia as well as manufacturing boilers and water engines. The firm laid the first six foot main for the Sydney water supply and in 1899 manufactured and laid the 350 mile pipeline for the Perth-Coolgardie water scheme. Charles married Emily Wallis in 1881 in Sydney and they had nine children. Their home during the Lithgow years was at 'Eskroy Park', Bowenfels, a property of approximately 1200 acres. This property is now the Lithgow Golf Club and the family home is the clubhouse. From 1908 until his death in 1926 Charles Hoskins transformed the struggling Lithgow Ironworks into Australia's first successful and economically viable steelworks. This has to be seen as a most remarkable achievement particularly for a man in the last twenty years of his life. His obituaries capture much of his character and contribution to Australia, which should stand as worthy examples for future generations. "Mr Hoskins will be remembered as a great 'captain of industry', as a man who played an important part in building up what was the most important industry in the Commonwealth, and as a person of indomitable pluck, enterprise and perseverance. He was associated with some of the greatest engineering enterprises in Australia." "Charles Hoskins realised that the way to achieve success was to give his adopted country the best possible service, and, if possible, better service than any of his competitors". "He had the great essentials of a successful organizer; ambition to do great things, amazing clarity and vastness of vision. He never bit off more than he could chew. He made his plans thoroughly, leaving nothing to luck. Every contingency was meticulously provided for, every risk foreseen".